If you just want some fabric eye candy, scroll past all these long paragraphs about my life to the eye candy. Otherwise, tune in for the developments around here. So, this week has flown by in a whirlwind. I haven’t necessarily been overly busy, but the decision-making part of my brain has been going 100 mph, which is exhausting. I told my realtor that I’d decide by Monday morning whether I’d list the house. Why is this such a tough decision to make? Well, barring the lack of central air conditioning and the semi-obnoxious neighbor on one side of me, this house has been quite a suitable home for over six years. I’ve remodeled and stripped wall paper and painted and stripped more wall paper and painted. I’m almost done with projects and ready to breathe a sigh of relief, and I can look at each room and remember the awesome friends that helped out with each one. At the same time, I’m a single girl who does have a limit to her home improvement skills, and this 1920s house isn’t getting any younger. Plus, at this point, I’ve pretty much maxed out the pricing for the neighborhood. I could add central air, but I’m not sure I’d see a return on investment. Interest rates are low but climbing, and this might be a good time to cash in my sweat equity and move on. I’ve checked around, and I think I could find a place where I don’t share walls with anyone, a place with central air and replacement windows. Maybe even a place with a cavernous finished basement and a bigger yard to facilitate more entertaining. As a matter of fact, I visited an open house last Sunday, and it had almost everything on my list of things I’d want in a house. I started to picture where the furniture was going to go. But, do I want a higher mortgage even if I can afford a higher mortgage? That can bring its limits. For example, right now, I could almost run screaming into the night and take a job as a Starbucks barista and still afford the place…not that I’m actually planning on doing that. Pretty soon, I’m just going to need to make the decision before I make myself crazy. Ok, on to the eye candy — I’ll be able to get cutting directions for the star surround quilt along on Monday, so much to the electric company’s dismay, I’m further stressing this heat-wave stressed power grid by washing my quilt fabric. I’m going with the yellow, black, red combo that I posted before. Some time ago I went on a fabric shopping spree through a clearance section,and I thought before I threw everything in the wash to get wrinkled, I’d snag some quick pictures. 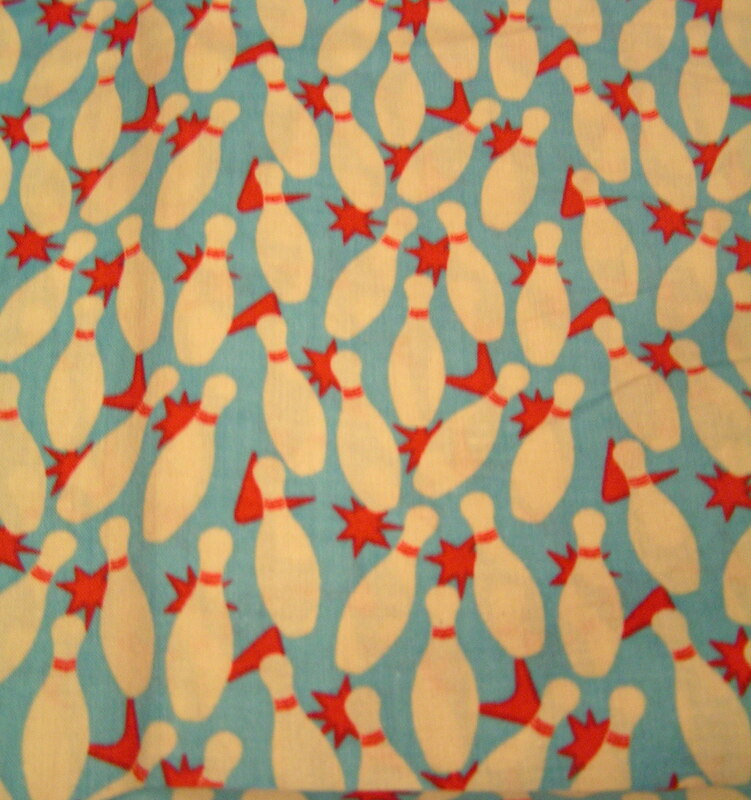 Here’s the promised eye candy I had a quilt in mind for these fun little bowling pins, but I also want to refinish some lamps and shades this summer to post on Etsy. It just occurred to me that I could make a pretty cute lamp shade out of this fabric too. Maybe if I play my cards right, I can do a little bit of both. 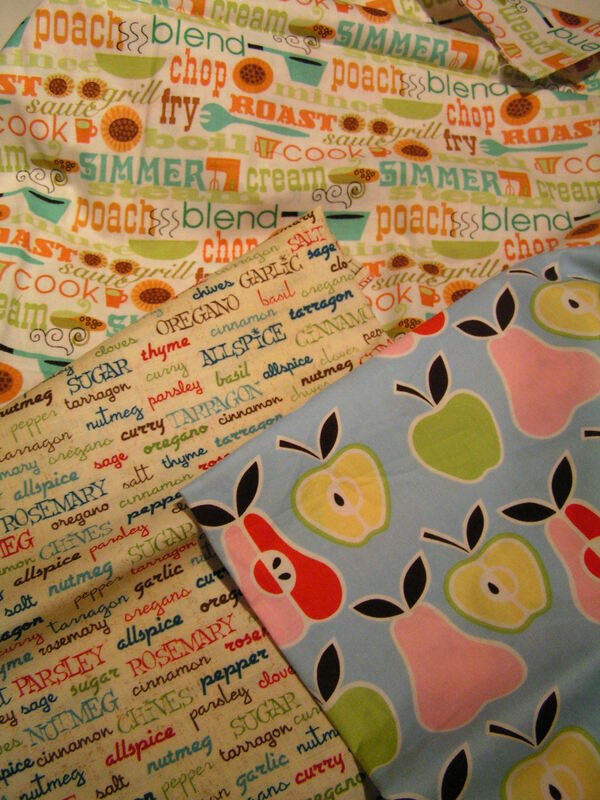 I have a few kitchen projects that I want to do, so these fabrics are going to go towards them. The colors clash as much as possible between the three, so they won’t be used together, but I think each fabric is definitely cute in its own way. 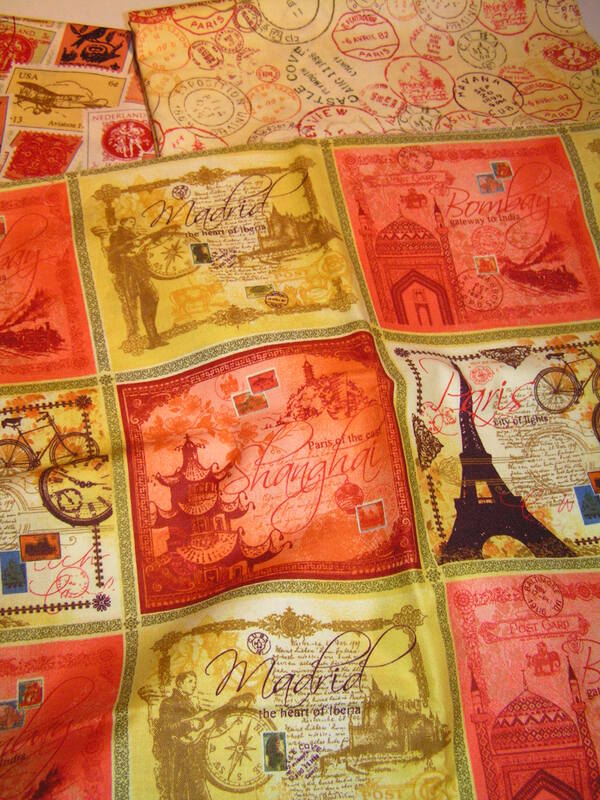 Then, I got this line of travel fabrics – postmarks, stamps, and postcards galore. I’m not quite sure what I’m going to do with all of it. Maybe once I jump into my Craftsy block a month classes, I’ll find a project for them. Or, I’m kinda thinking that with the postcard fabric, I want to go off the map. Visions of appliqueing the postcards to patches of corduroy and then attaching those to er…some other kind of fabric still to be determined could make a super fun lap blanket. Then, there was this fabric. 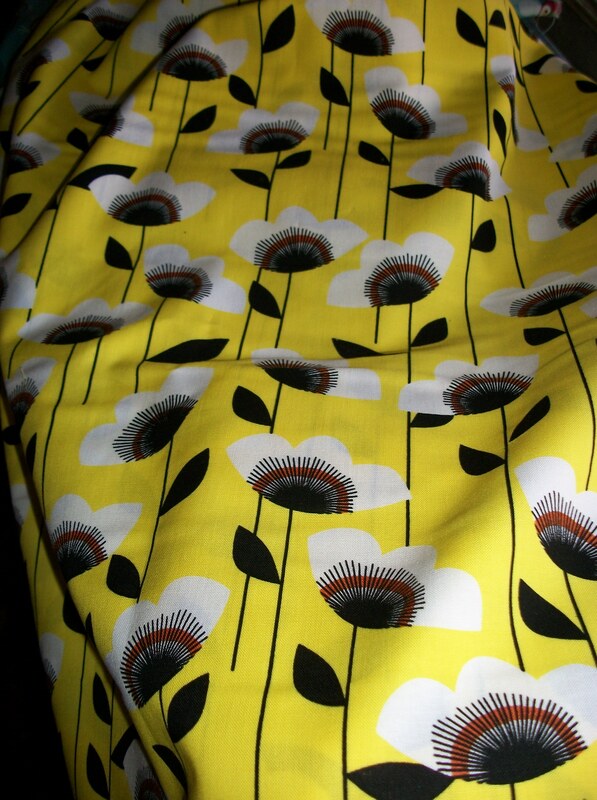 I saw it once at the fabric store, resisted it, and then couldn’t resist and went back to buy it. But, then I realized that the yellow is quite unique, and it could be difficult to find something that I wanted to pair with it. 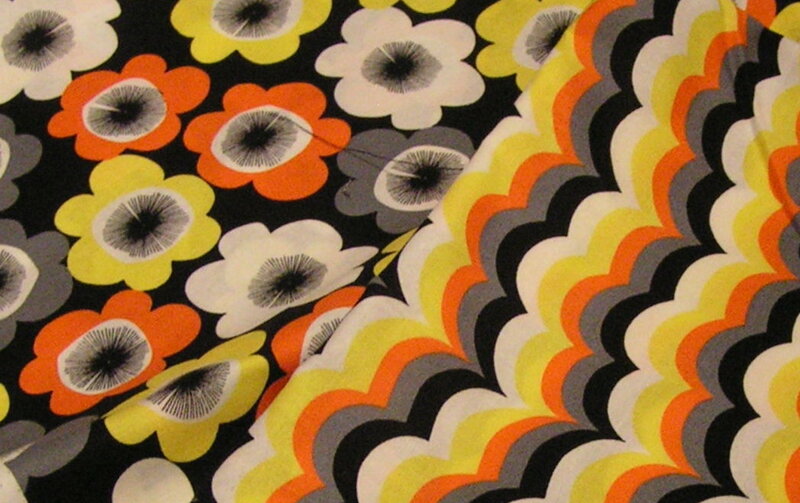 I have the pattern that I’m going to use to put these three fabrics (plus a healthy dose of black fabric) together. And, it’s either going to be the gaudiest quilt known to man or the most awesome. This entry was posted in quilting, that's life and tagged quilt. Bookmark the permalink.